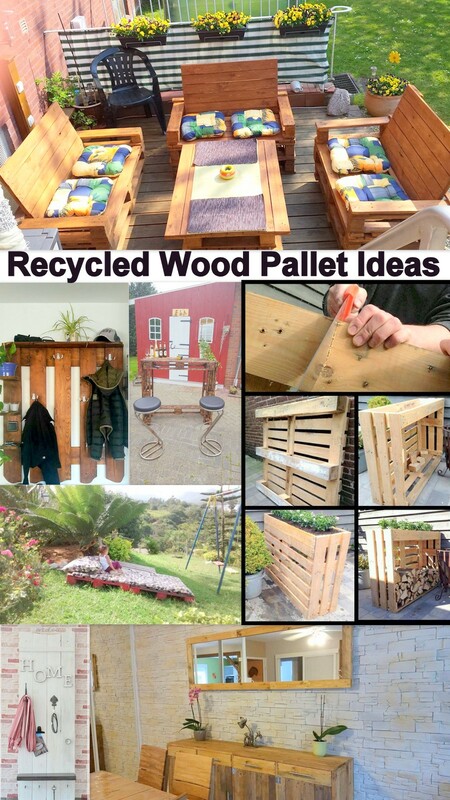 Despite of giving of hundreds and thousands of wood pallet recycling ideas, this seems like the folks are still craving for more and more. Sometimes it feels like all the surfers have created their own domestic workshops and they don’t go movies and shopping anymore, they have got themselves quarantined and confined to their workshops. That’s we are asked on permanent basis that when we are intending to bring in some fresh stuff. 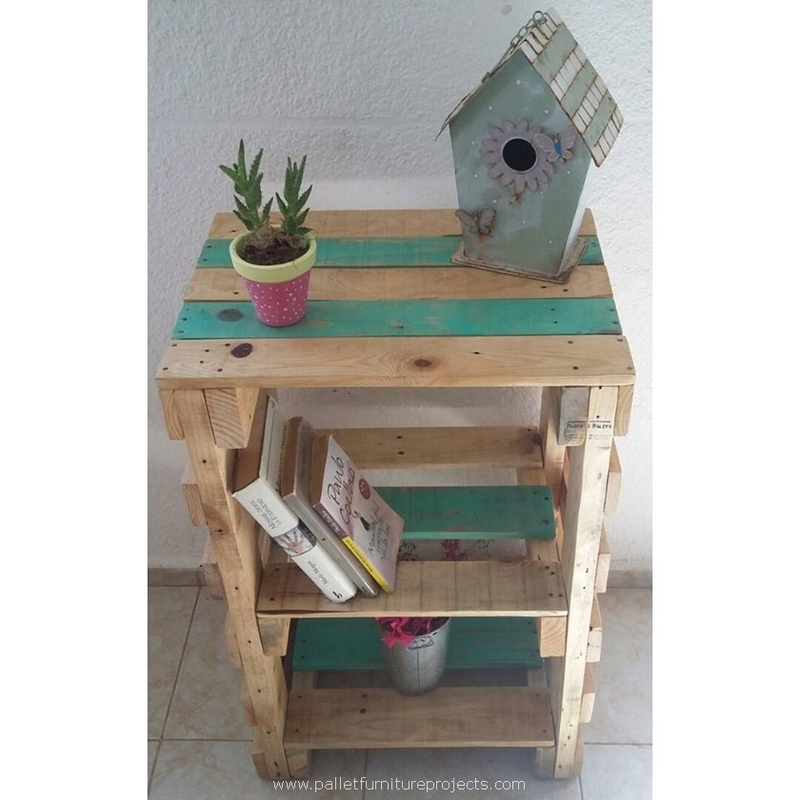 Even we feel like there is no limit to the wood pallet upcycling ideas, with very minor modifications we generate completely new and different products. Pardon me I am starting with this relatively nasty wooden furniture range. 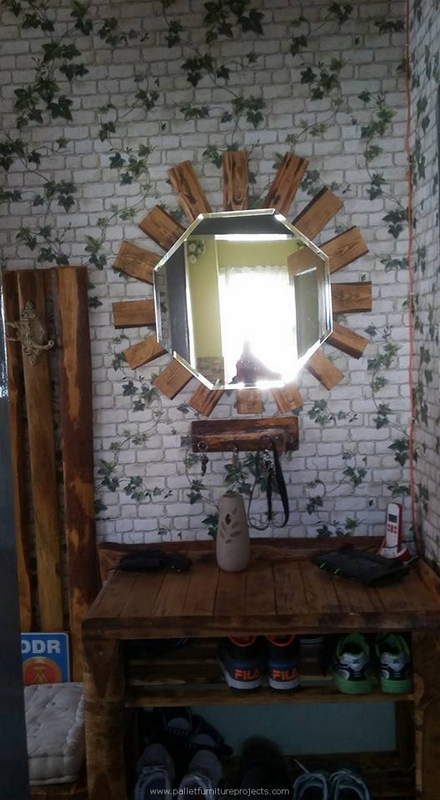 This was ofcourse made with some aged and deteriorated shipping wood pallets, but don’t go for the outlook and think about the fact that how huge accommodation it is going to offer you guys. Isn’t that something to be happy about? Well, this kind of tables are pretty trendy in marriage halls and lavish restaurants. This is not as if the table top is simple placed on this squared base, but this is firmly made intact by nailing and gluing. 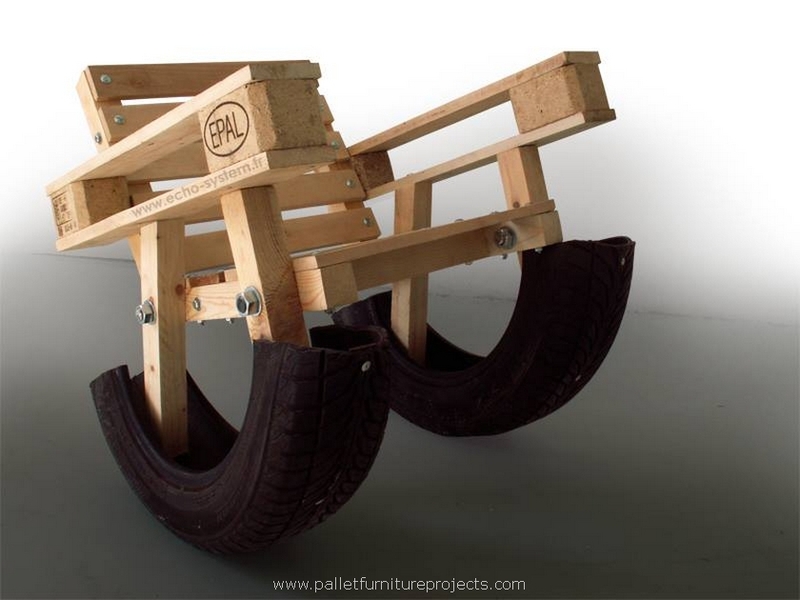 This is a new idea in the range of pallet wood crafts. Such isolated sitting areas are normally made in some tiny apartments where you are not spared with some wider spaces. But despite of the congested spaces, if you are equipped with the furniture that is accordingly designed, this makes one of the best places and same we do see here. Well, this one is much classified and modified shape of a dressing or side table. This is not a simple wooden pallet table but it is provided with multiple huge drawers which are more than enough for a lot of accessories. While the mirror right above would compliment you while combing your hair. Here we have exploited more the shape of the mirror that was installed along the wall. As the mirror itself has got a nice shape so we just planned to give a slight touch of the wood pallet planks all around the mirror and I guess the idea really worked. 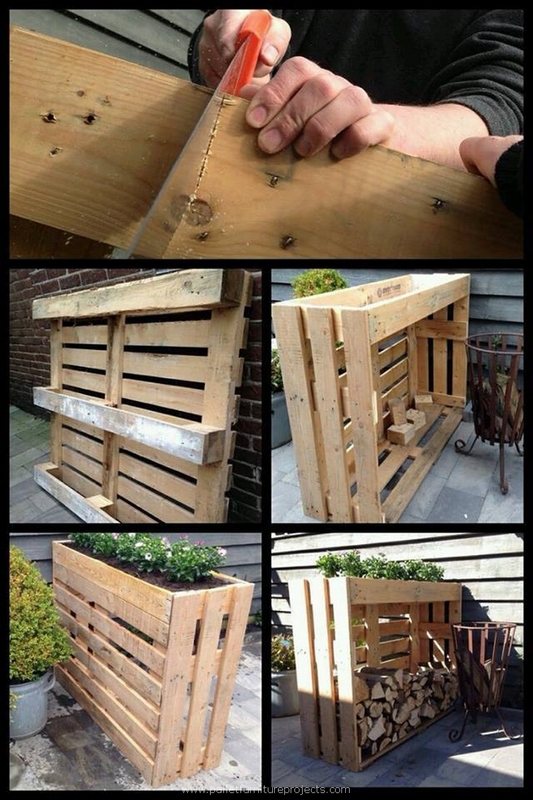 While this is a detailed tutorial of making this vertical wood pallet garden or planter. This slim planter is made in such a manner that from one side it is left wide open where we can store some debarked wooden pieces that would be consumed in bonfire. Okay, the man with a nail gun is deeply indulged in nailing a pair of the shipping pallets. This is actually the raw base that is being designed and made for the lower frame of the wooden pallet repurposed room bed. This would help raising the room bed from the ground level. 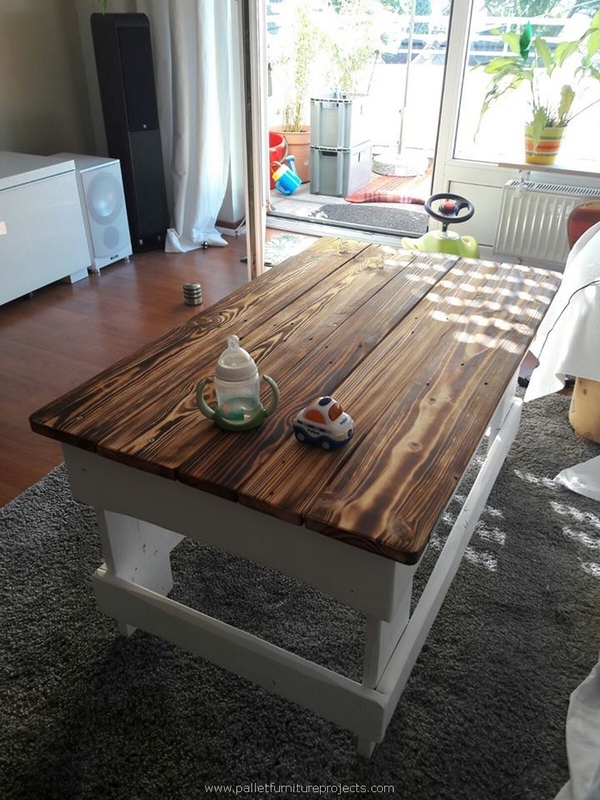 And this is a very decent pallet wood made furniture range that could be counted as one of the best pallet wood creations so far. 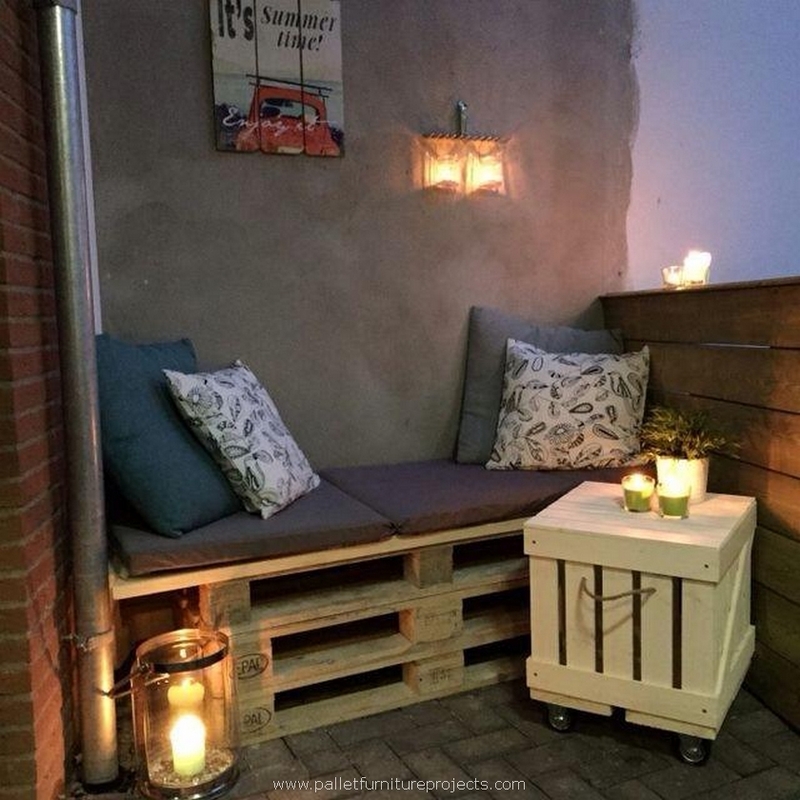 Not only this but we also see proper pallet wood made deck right beneath the furniture that is a complimentary installation. If you have got a wide spread green landscape and you also frequently spend time over there then it is mandatory that you equip this area with proper wooden furniture range. 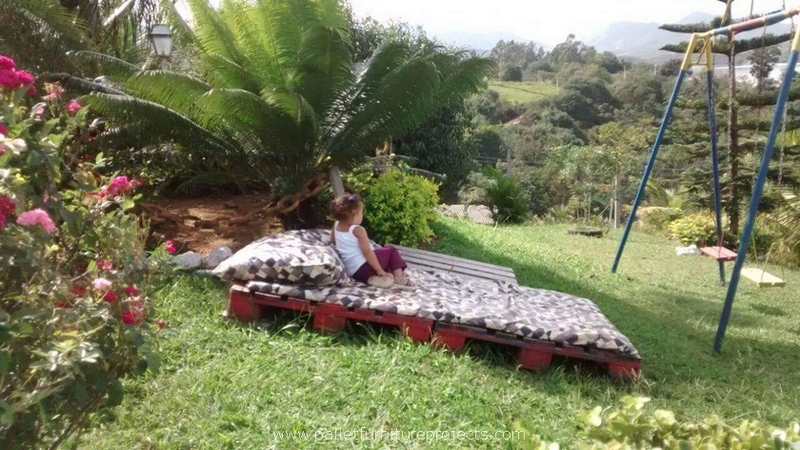 Infact a daybed would be a far better choice especially for the kids that’s why we have presented this simple raw wood pallet daybed. 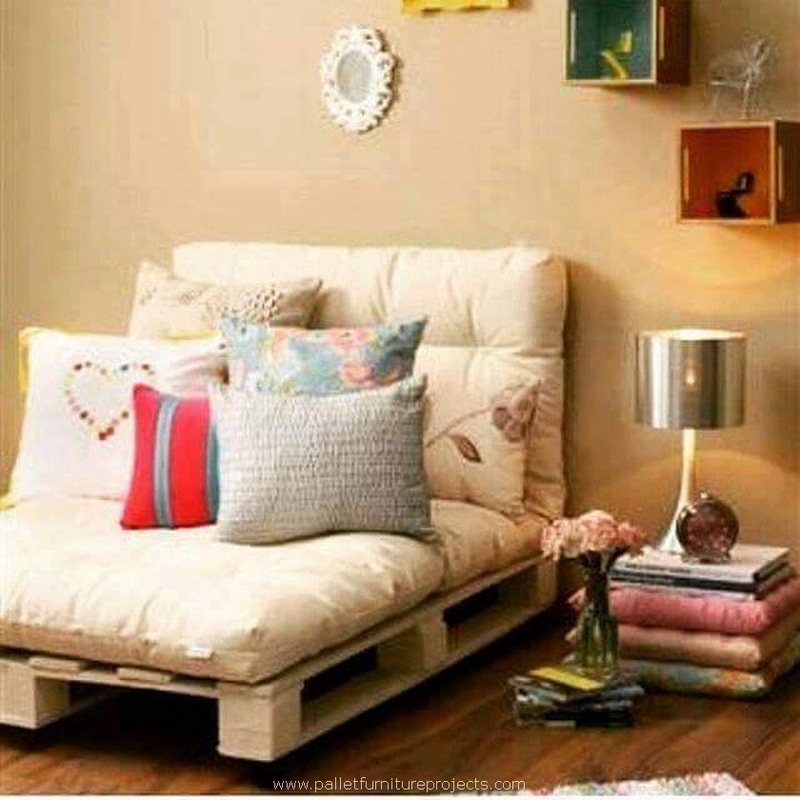 This is another inspiration of the wood pallet daybed. 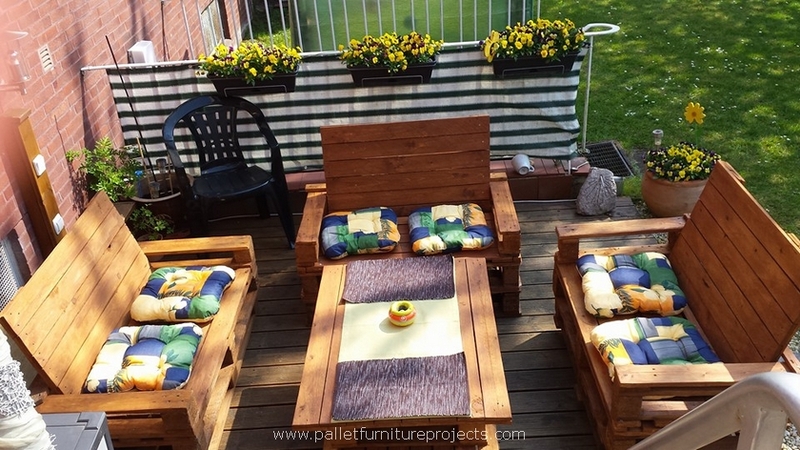 Although it is a bit small space wise, but the wooden daybeds are supposed to be normally sized or else they would just look like a proper room bed and would capture more than expected or estimated. 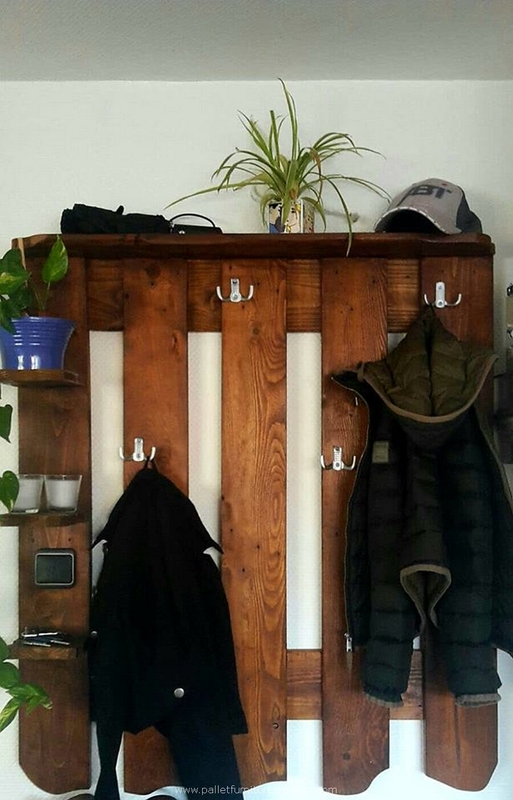 This is one of the simplest pallet wooden wall shelves. 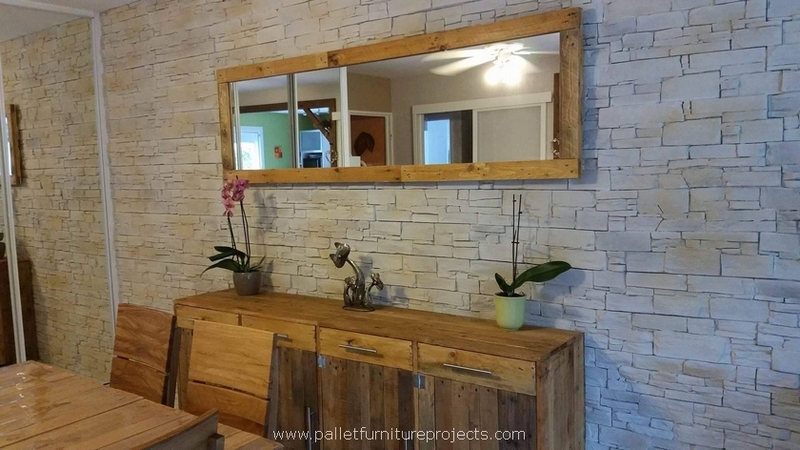 This is just like placing some straight wood pallet planks along the wall, and adding a couple of extensions as racks, as simple as that. Well, you can also do some staining if you like so. And this set up is supposedly created for the kids, they really feel comfortable on such casual and informal wooden furniture items because they are not all ok with the formalities. 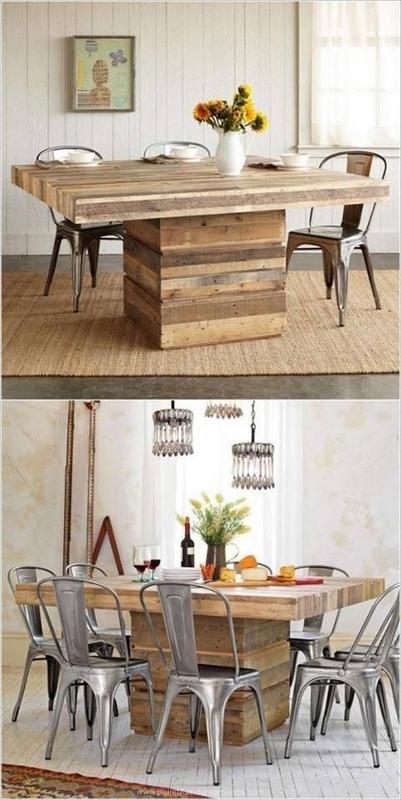 I guess they would just enjoy their brunch or some snacks being served on this raw wood pallet creation. If you are an amateur wood pallet crafter then let me take the pleasure to tell you that when we are intending to do some wall cladding, that is also done using this very pattern over here. Like first we set a base and then fix the rest of the pallet wood planks on them. We have made a number of side tables in this shape for indoor use, but this time we have applied the same pattern on this raw wood pallet made bar. 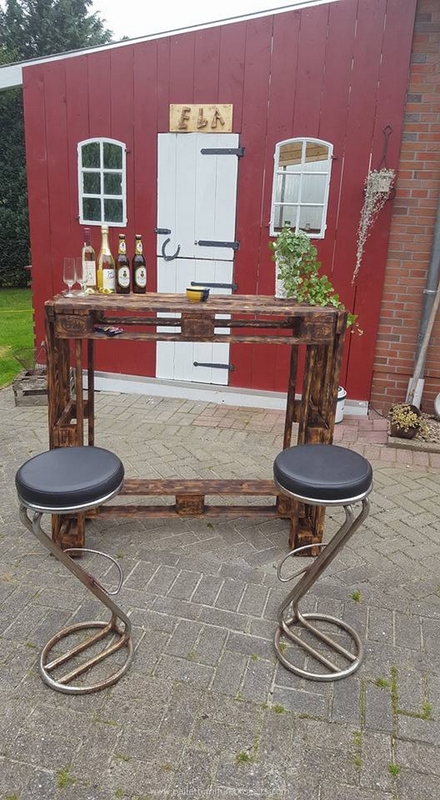 As you can see a couple of wine bottles on the table top, I think this has elaborated the purpose of this smart wood pallet creation. 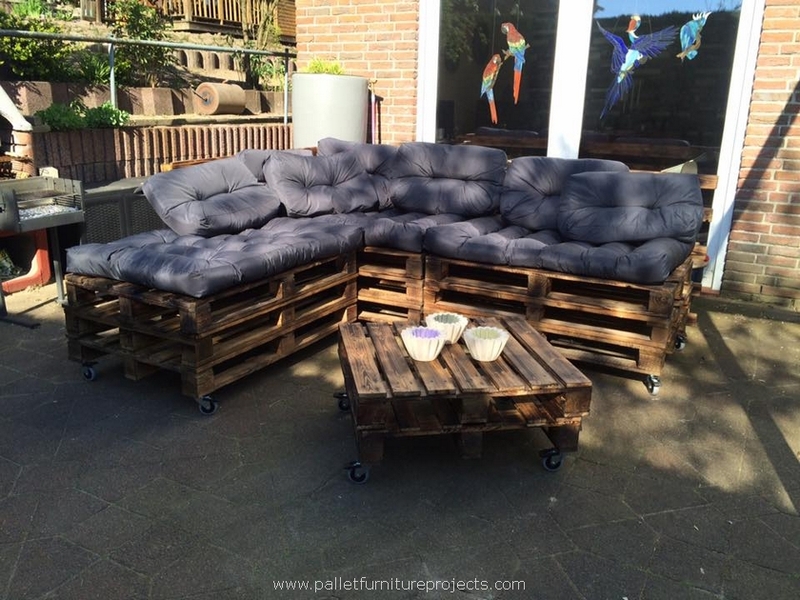 Wow, this is called real smart wood pallet upcycling. 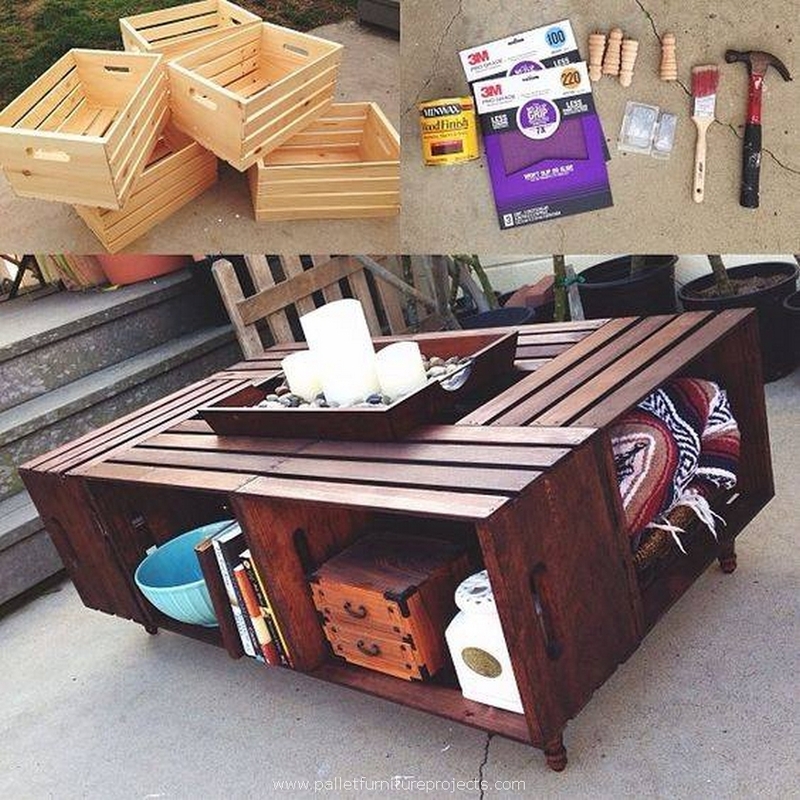 As we have again consumed here wood base material that is actually the wooden fruit crates, this coffee table is made in such a smart way that it also provides a lot of storage hacks and spaces. 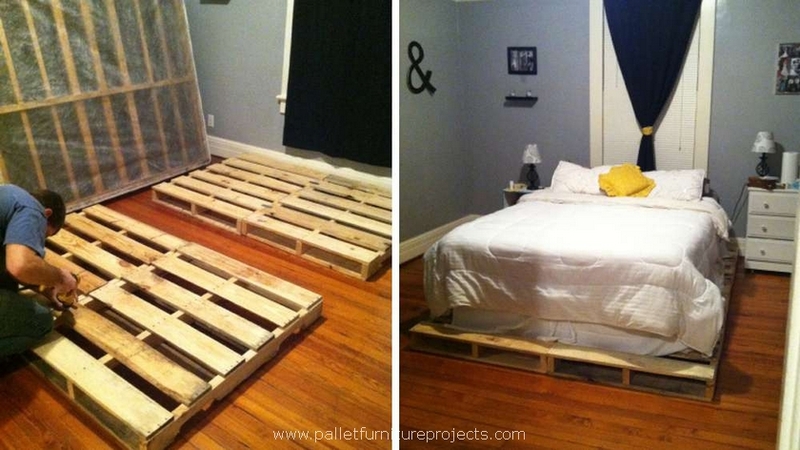 This bedroom I guess belongs to some fanatic wood pallet crafter who was willing to be surrounded by several wood pallet creations and we can clearly see that the entire room is stuffed with various pallet wood creations, the room bed, headboard, planter container all of them are the creation of the same timber. I don’t think that the side wood pallet made table could get any simpler than this one. And the good thing about this side table is its design which is so generous to offer us some multiple services like it would be used as a tiny side table and a lot of stuff could be placed inside the table. 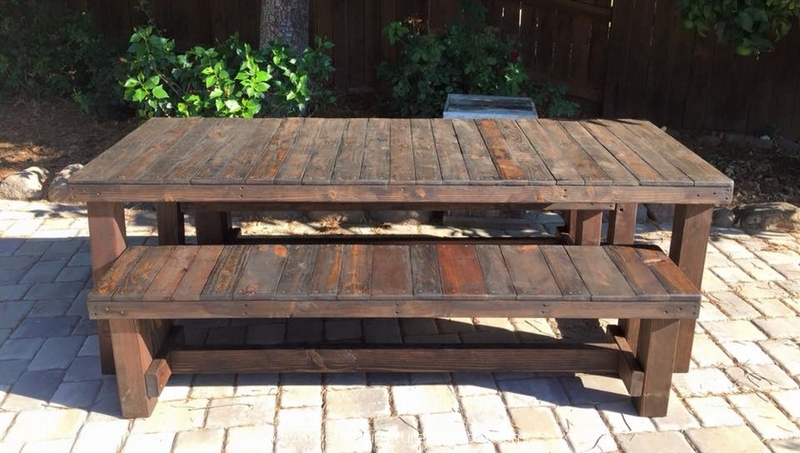 And finally we thought to revive some great pallet wooden coffee table and we came up with this gorgeous plan where we have introduced a cunning contrast of different shades between the table top and the rest of the frame.